home > Bradbury > Bradbury meeting room specification. Meeting room combined with the coffee bar capacity. The Meeting Room is part of a new building that was constructed in 2010 to a very modern design and fully complies with all the latest safety, sustainability and disability requirements. There is a flat ceiling with a roof window lantern to provide plenty of natural light and ventilation and there is a light coloured sprung wooden floor. One wall is part of the original stone church wall and contains obscured arch style windows. There is a picture rail on one wall suitable for hanging paintings or attaching flip chart paper etc; There is easy level access to the Bradbury Hall and the Coffee Bar and the Meeting Room can be used on its own or as additional circulating space for the Main Hall or the Coffee Bar. The Meeting Room has easy level access to the Coffee Bar via a folding set of doors which when opened provides a larger flexible space. Width - 4.2 metres (13 feet). Length - 5.6 metres (18 feet). Height - 2.4 metres (7 feet). Floor area - 23.5 square metres (253 square feet). Access from the street is via 2 sets of double doors at right angles to each other with the maximum size of 1.38metres wide x 2metres high and through the Coffee Bar. Access from the Bradbury Hall is via two single doors at right angles with each other. The number of people allowed in the Meeting Room depends on the use and the risk assessment carried out for the event. Please do not invite the maximum numbers to your event until we have agreed that your event will comply with safety regulations. Social gathering with everyone standing - 36. Board Room style with a central table 3650 mm x 1400 mm - 16 sitting around the table. The Board Room Table is made from 5 tables of 1400 mm x 730 mm which can easily be separated. Social gathering with everyone standing - 44. Theatre Style with everyone seated in rows - 30. The Meeting Room and the Coffee Bar can easily be converted into one large area by opening the folding partition wall. 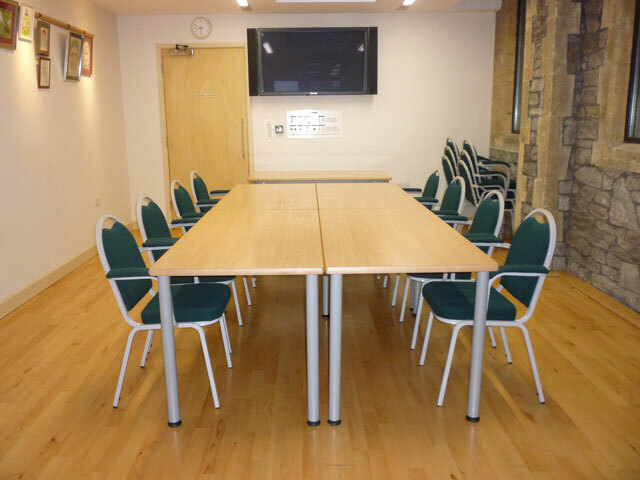 5 x Heavy duty 1430 mm x 7300 mm tables with imitation light oak tops are available to make up the boardroom table. Additional tables can be provided on request. There is a Wi-Fi Broadband system - password controlled - which you may use free of charge at your discretion and at your own risk. Note that we do not have technical support available on a 24/7 basis and you should have a back up plan in case the Wi-Fi system goes down during your event. A Data Projector is not provided but there is provision for a projector to be connected at the rear of the meeting room. There is a 50” plasma screen with speakers fitted to the end wall. A full set of input connections are provided. Fluorescents to provide general lighting. 4 x low voltage wall spotlights to create mood lighting. 10 x low voltage overhead spotlights to create mood lighting. There are 5 preset lighting states and an overall raise or dim feature. The lighting can be controlled from any one of 2 positions around the Meeting Room. The room does not currently have an Induction Loop system. The installation of an Induction Loop system is planned. There are two other loop systems in the immediate area which can affect the space with cross talk. 5 x Double 13amp Socket Outlets are positioned around the Meeting Room. There are two RJ45 Data connection points adjacent to the plasma screen which terminates at a patch panel in the services room. This will allow the patching of equipment around the building. Heating is provided via a fan assisted radiator which will maintain a constant temperature of 20°C. The heating, if required, is automatically activated upon first entry to the Meeting Room. There is an electrically operated roof window. The roof window has an electrically operated blind to provide dim-out. The Meeting Room cannot be blacked out completely using the fitted blinds.